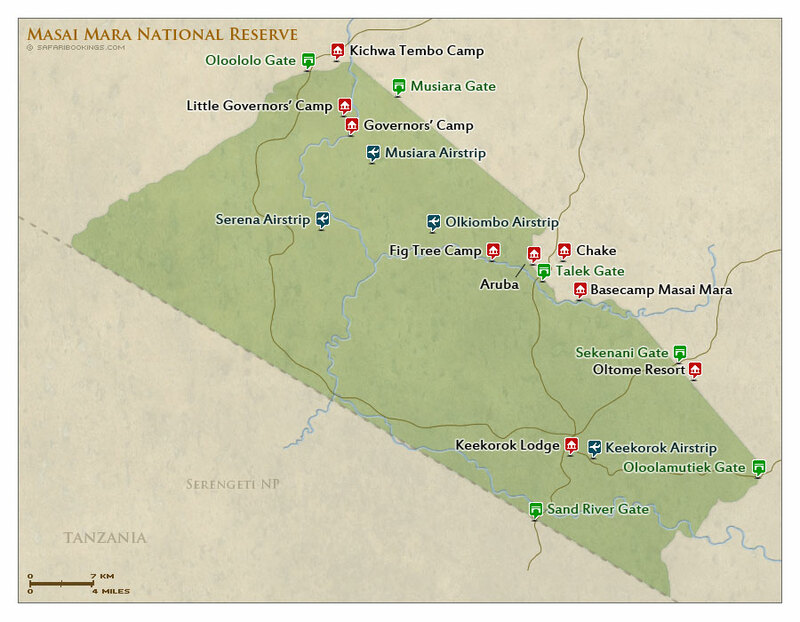 Masai Mara National Reserve – Travel Guide, Map & More! The Masai Mara is one of Africa’s most famous parks. The wildlife viewing is superb throughout the year. The park’s abundant vegetation and regular rainfall supports a huge population of herbivores, in turn attracting many predators. All three big cats are relatively easy to see. The yearly wildebeest migration coming through the park is one of the world’s most amazing wildlife spectacles. Just outside the Masai Mara NR are a number of conservancies and private reserves run in partnership with local Masai communities. The Serengeti-Mara ecosystem is home to the annual wildebeest migration where 2.5 million wildebeest, zebra and gazelles follow the rains in search of new grass. They make their way from the Serengeti to the Masai Mara somewhere around July and August, and usually arrive in September. 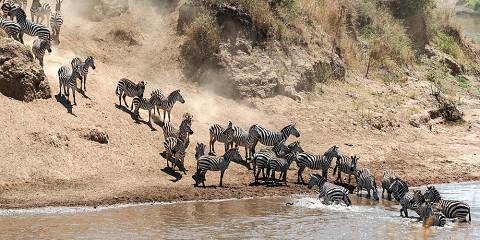 The crossing of the Mara River along the way is one of the highlights of this spectacular event. They slowly head back into the Serengeti again around October. 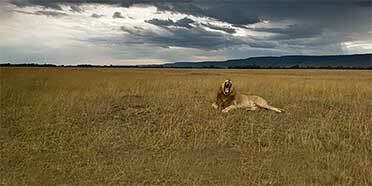 The Masai Mara is one of the best parks in Africa for seeing big cats. 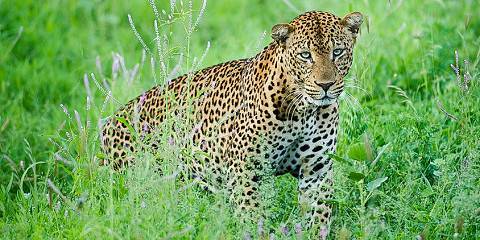 Even leopards are generally relaxed, and their behavior can easily be observed. Cheetah are often spotted on the open savannah eyeing off their next meal. 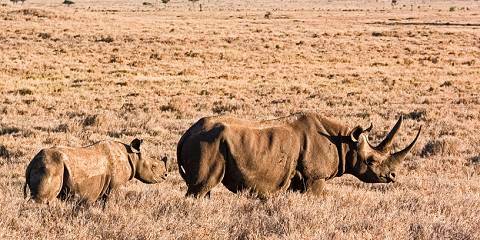 Of the other Big Five, elephant and buffalo are plentiful, but black rhino is trickier and can only be found in certain areas. The Masai Mara’s scenery is dominated by grassland savannah, but pockets of acacia woodland, riparian forest and rocky hills intersperse the plains. The Masai word 'Mara', meaning spotted, refers to these dots in the landscape. Masai Mara has a generally mild climate that doesn’t deviate too much from a comfortable 25°C/77°F in the region’s Dry season (June to October). Variations in temperature are mainly due to changes in altitude in the park, with conditions getting cooler the higher you climb. The Wet season (November to May) comprises a shorter and a longer rainy period that sandwich a brief dry spell. The interlude between the short and long rains (January and February) and the Dry season proper (June to October) are the times to visit Masai Mara. The roads haven’t yet deteriorated because of rain, and thirsty animals crowd around the local waterways. The last two months of the Dry season are often when the spectacular annual wildebeest migration passes through. Want to Visit Masai Mara NR? Part of huge national park. I enjoyed a lot.